Inventory We are a resale marketplace, not a box office or venue. Ticket prices may exceed face value. This site is not owned by Fox Performing Arts Center . The Fox Performing Arts Center Riverside opened in 1929 and is still providing concert and show goers in the Los Angeles metro area tremendous entertainment. 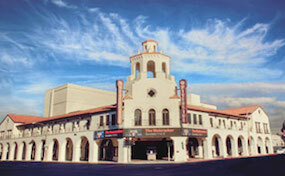 The Fox Performing Arts Center box office is located at 3801 Mission Inn Avenue in downtown Riverside, California. The facility underwent a massive $35 million dollar renovation completed in 2009. Recently purchased by LiveNation the venue has been predominately used for intimate concerts and comedy shows. Locals also commonly refer to the facility as the Riverside Fox Theater. PerformingArtsCenterRiverside.com is a privately owned and operated company that operates solely in the online secondary resale marketplace. We have no affiliations with primary vendors, official websites, and or any box office. Prices on our sites may be well above face value and can change quickly with market conditions. To order tickets online for all Fox Performing Arts Center Riverside events please follow the steps through the checkout.